Make one-skillet dinners in a pan you’ll come to cherish. When I spotted the black cast-iron skillet at a yard sale in the late 1960s it was love at first sight. Having arrived from Europe (I grew up in Barcelona) a few months earlier, I had never been to a tag sale. My then boyfriend, now my husband, and I were on our way to visit friends in Pennsylvania Dutch Country when we came across a sale at a stone farmhouse flanked by two sugar maples in full autumn regalia. There, on a long table covered with farm tools, was the skillet. Three dollars later, it was mine. I soon found that it was the perfect tool for cooking everything from a simple side of sautéed cabbage to a whole roasted chicken. I had always cooked with copper and light carbon-steel pans and this solid piece of cookware was a happy discovery for me. Although many people shy away from iron skillets because of their weight, they conduct heat beautifully, and go from stovetop to oven with no problem. Plus, they never buckle; you don’t have to worry about the finish being scraped off; and after decades of use, they are as good as new. Their high straight sides are great for one-dish meals, which means less to wash. Plus, consider the health benefits: food cooked in a cast-iron skillet, especially acidic foods like tomato sauce, has increased iron content, in some cases up to 20 times as much. Of course, you have to treat these skillets right. When I bought my first iron skillet, I asked the farmer’s wife how she cared for it. She told me how to season it—making the pan virtually nonstick. For years I have passed her method on to students in cooking classes I teach at my home in Connecticut and across the country: Cover the bottom of the pan with a thick layer of kosher salt. Add at least half an inch of cooking oil and place over high heat. When the oil starts to smoke, pour it into a bowl together with the salt. Using a fat ball of paper towels, rub the inside of the pan until it is smooth. The skillet is now seasoned. Today, most cast-iron skillets are preseasoned when you buy them. With any cast-iron skillet, you may occasionally get hot spots and some sticking. To eliminate that, reseason the offending area by rubbing it with coarse salt and a little oil. And, the farmer’s wife never used soap. She simply scrubbed her skillet with a stiff brush and hot water and made sure to dry it completely. Admittedly, iron skillets are not the only skillets I use. I find, for instance, that modern coated nonstick skillets are better suited for sautéing fish fillets and for egg dishes. But if I could have only one piece of cookware it would be a cast-iron skillet. These recipes are evidence enough that the cast-iron skillet is one of the most versatile and indispensable tools you can find. Chicken and scallops sear up golden. Over lower heat cucumbers gently wilt. 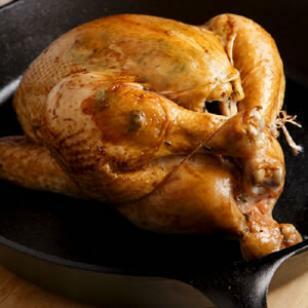 And a whole chicken turns brown and crisp when you start it on the stovetop then finish it in the oven in a single pan. The main point is this: whatever you whip up in this classic skillet will cook perfectly and that is what counts.